Spring Festival, also known as the Chinese New Year, is the largest and most important annual celebration in the Chinese culture. The festival celebrates the coming of the New Year, which falls on the first day of the first month of the lunar calendar. Lunar calendar is different from Gregorian calendar, which is used internationally. This year, for example, the Chinese New Year falls on February 5th, known as the Year of the Pig. Each year is named based on the 12 Chinese zodiacs. Do you know what animals represent the 12 Chinese zodiacs? The preparation for the festival can start two weeks in advance. Most activities are carried out by adults, with some fun parts for kids to enjoy, such as wearing new clothes, eating plenty of sweets, and getting gift money. In China, kids don’t go to school as during there is a one-week Chinese New Year holiday. Spring cleaning is a must. Out with the old and in with the new. It is done to welcome new luck for the New Year. Children are usually not involved in the cleaning activities but they will experience the busyness at home, usually carried out one week before the New Year. On the first day of the New Year, Chinese kids will wear new clothes, usually in red or other bright colors. Black or white are a no-no as they are not considered to be auspicious colors. As the New Year falls in January or February, it is a good time to shop because of after Christmas sale. Households will decorate their houses with Chinese New Year decorations. They are usually in bright red. Popular decorations include red lanterns, hanging decorations (firecrackers, God of Wealth, character 福 meaning fortune), couplets, scrolls, and kumquat trees. Often the word 福 is pasted upside down on the door. This is a play of homonym (the word “upside down” in Chinese is similar to “arrive”) that symbolizes the arrival of fortune. On the eve of the New Year, families will gather to have dinner. That is why the Chinese New Year’s Eve dinner is also called reunion dinner. This is a time when families reunite. Those who live in a different city or town will travel back home to have dinner with their parents. 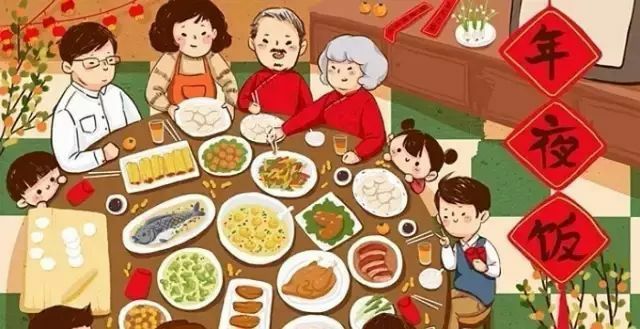 For daughter-in-laws, they will have reunion dinner with their husband’s family, and on the second day of the New Year, will return home to visit their parents, bringing along the children. The reunion dinner is a big part of the Chinese New Year festival. Traditionally, families will prepare a sumptuous dinner. A variety of food symbolizing good luck are served. Modern families can simply go to restaurants to have reunion dinners instead of preparing their own meals. Kids will receive red packets (envelopes containing money) from their parents and grandparents at the reunion dinner. In Northern China, people eat dumplings to celebrate the festive. In Southern China, people eat glutinous rice cake for the occasion. On the first day of the New Year, first thing in the morning, Chinese kids will wish their parents a happy New Year. People will greet each other by way of “gongshou”, this means having one fist wrapped with one’s other hand, put in front of the chest and shaken several times while saying “Gong Xi Gong Xi” (meaning congratulations). Parents will also give their kids red packets if not already given the night before during the reunion dinner. Families will travel to visit their paternal grandparents on the first day of the New Year to extend greetings. In the past, typically the grandparents will live together with their first son’s family. Nowadays, it is not uncommon for the grandparents to live separate from their children’s families. Kids will receive red packets from their grandparents after extending the New Year greetings. 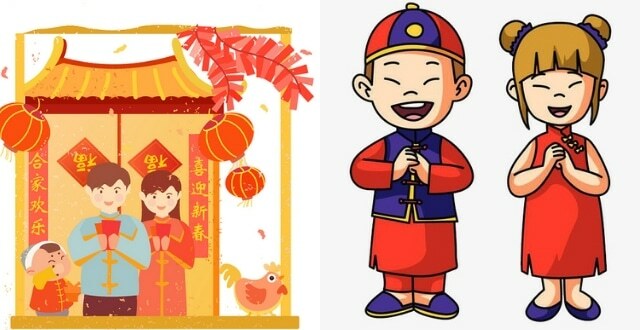 The New Year is an exciting time for kids as not only they get to wear new clothes, but also they will receive many red packets from relatives and family friends, eat a lot of food especially sweets (a play of homonym that means fruition of one’s efforts), and not go to school for one week. In the first day of the New Year, New Year visits are made within the paternal side of the family. Kids get to visit their uncles and aunties from their father’s side and get red packets from them. The more uncles and aunties they have, the more red packets they will be getting. On the second day of the New Year, kids will visit maternal grandparents, and also their uncles and aunties from their mother’s side, and receive red packets from this side of the family. On subsequent days, families may visit their friends and extended families, or receive visitations from friends and extended family members.